Brother André expressed a saint’s faith by a lifelong devotion to St. Joseph. Sickness and weakness dogged André from birth. He was the eighth of 12 children born to a French Canadian couple near Montreal. Adopted at 12, when both parents had died, he became a farmhand. Various trades followed: shoemaker, baker, blacksmith—all failures. He was a factory worker in the United States during the boom times of the Civil War. At 25, he applied for entrance into the Congregation of the Holy Cross. After a year’s novitiate, he was not admitted because of his weak health. But with an extension and the urging of Bishop Bourget (see Marie-Rose Durocher, October 6), he was finally received. 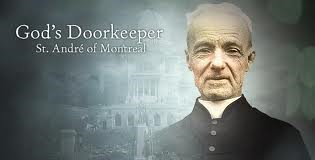 He was given the humble job of doorkeeper at Notre Dame College in Montreal, with additional duties as sacristan, laundry worker and messenger. “When I joined this community, the superiors showed me the door, and I remained 40 years,” he said. For many years the Holy Cross authorities had tried to buy land on Mount Royal. Brother André and others climbed the steep hill and planted medals of St. Joseph. Suddenly, the owners yielded. André collected 200 dollars to build a small chapel and began receiving visitors there—smiling through long hours of listening, applying St. Joseph’s oil. Some were cured, some not. The pile of crutches, canes and braces grew. The chapel also grew. By 1931 there were gleaming walls, but money ran out. “Put a statue of St. Joseph in the middle. If he wants a roof over his head, he’ll get it.” The magnificent Oratory on Mount Royal took 50 years to build. The sickly boy who could not hold a job died at 92. He is buried at the Oratory. He was beatified in 1982 and canonized in 2010. At his canonization in October 2010, Pope Benedict XVI said that St. Andre "lived the beatitude of the pure of heart." Rubbing ailing limbs with oil or a medal? Planting a medal to buy land? Isn’t this superstition? Aren’t we long past that? Superstitious people rely only on the “magic” of a word or action. Brother André’s oil and medals were authentic sacramentals of a simple, total faith in the Father who lets his saints help him bless his children. “It is with the smallest brushes that the artist paints the most exquisitely beautiful pictures,” said St. André Bessette.